If you happen to be at the Downtown Arlington Management Corporation (DAMC) office, you should be able to see this cute ray from EllengantCreations in person. How did this come to be? DAMC partnered with 817ArtsAlliance to bring the community a unique holiday shopping opportunity last year in the form of the Happy Holidays Pop-Up Market (HHPM), held in the front portion of their space. It was filled with creations from fifteen local artisans. 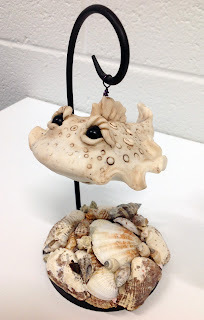 Ellen's whimsical polymer clay creatures were part of the assortment. The admin at DAMC kept being drawn to Ellen's sand colored ray and finally decided it needed to join her family. As a token of appreciation for sharing space with HHPM however, 817ArtsAlliance would not let her purchase it but gifted it to her (after paying the artist for her work). 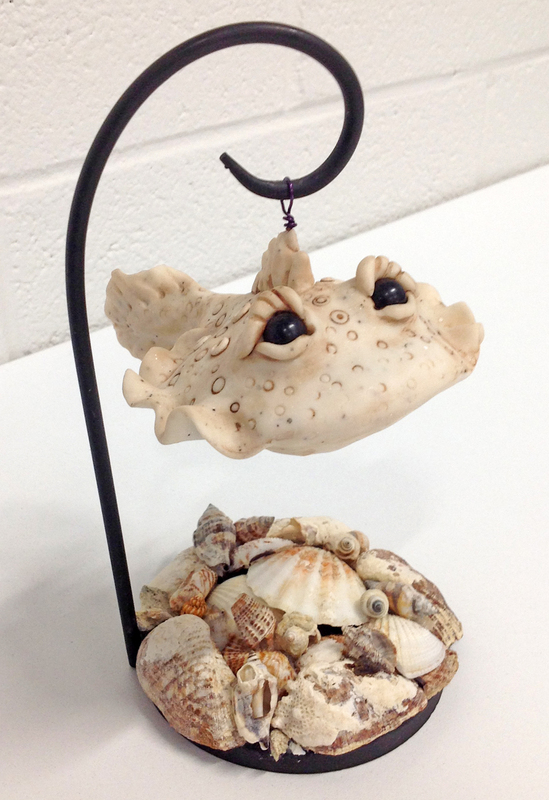 I embellished a plain black stand with seashells to complement the ray. Last time I was in the office, the ray was hanging out as part of the decor. One of these years I imagine it might go home with the admin. Until then, you can see one of Ellen's creations in person. 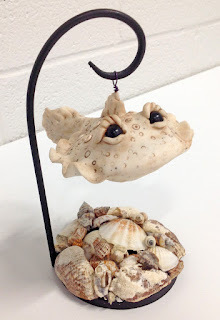 More whimsical creatures can be seen in her Etsy shop, EllengantCreations. Mistletoe - Friend or Foe?